The market environment of buffing and polishing wheel manufacturers is getting worse, because the industry profit margin is extremely low. So the rising labor cost became their greatest concern, Hightex serial automatic spiral sewing machines just came under this background. Many buffing wheels manufacturers are searching for machines not only to make the production process more automation, but also to lower the production costs (reducing number of employees). We devote ourselves to develop highly automated industrial sewing equipment base on the concept of "One-Worker-Multiple-Machine (OWMM)", for maximizing efficiency and controlling costs. Hightex #7373BP Automatic buffing wheels spiral sewing machine with low cost: it is affordable semi automated sewing equipment for manufacturers of buffing wheel and polishing wheels. Features in walking foot feed mechanism, 32 mm presser foot lift and 430 mm working area. Ideal for 1 / 2 "to 1" thick buffing wheels and polishing wheels made of cotton, sisal, flannel and Denim, max. diameter of wheel is 850 mm. One worker can operate 2-3 sewing units at same time. Hightex 204-370BP Automated polishing wheels sewing machine with spiral sewing device: it is advanced spiral sewing equipment for high end buffing wheel manufacturers. 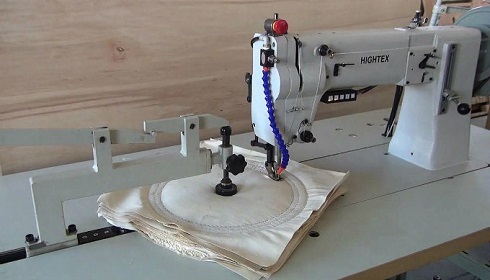 Features in triple feed sewing machine, needle protector (avoid needle bend or break when hit the knots of sisal wheels). Ideal for 1 / 2 "to 3/4" thick buffing wheels and polishing wheels made of cotton, sisal, flannel and Denim, max. diameter of wheel is 630 mm. One worker can operate 2-3 sewing units at same time. Hightex 733BP Automated spiral sewing machine for thick Sisal Buffing Wheels: it is heaviest automatic sewing equipment for sewing buffing wheels and polishing wheels. Features in extremely high needle penetration force, walking foot feed mechanism, 38 mm presser foot lift and 420 mm working area. Ideal for 1 / 2 "to 1-1/4" thick buffing wheels made of stiff sisal fibers, max. diameter of wheel is 830 mm. One worker can operate 2-3 sewing units at same time.